After some initial disinterest, ‘Torti girl’ has decided to make it her home. 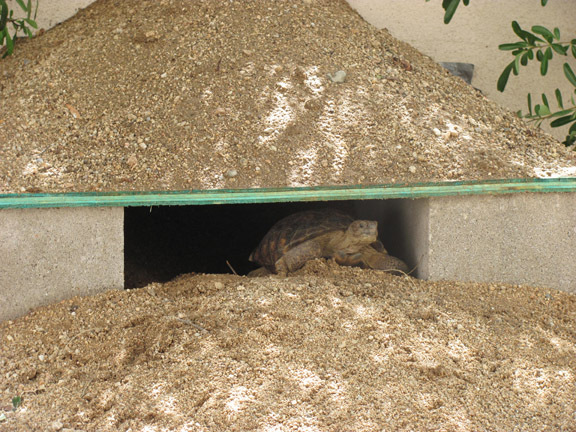 It took a terrible monsoon thunderstorm the other night, for her to appreciate her new digs…Todd had to pluck her out of the bushes where she was sitting in an inch of water, trying to weather the storm, and he put her in her new house. We found her still there in the morning. 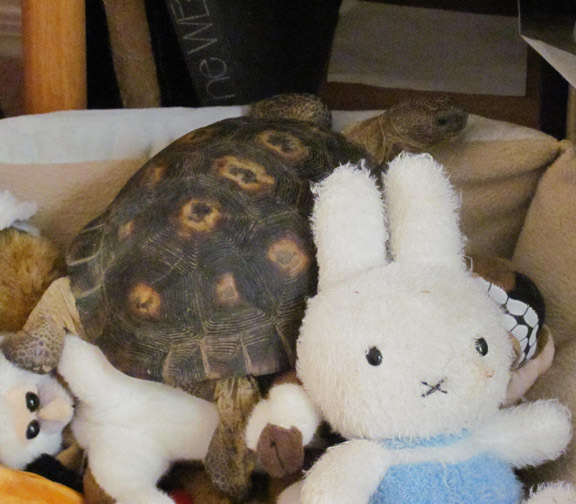 Our tortoise has really made herself at home!…In more ways than one! 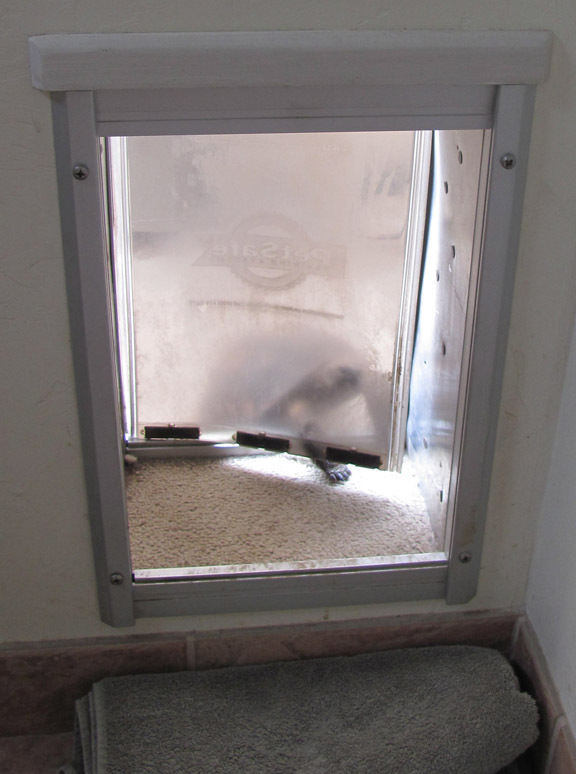 It only took her one day to find the doggy door! Un-phased by the dogs or other household hubbub, she marched right in the house, into our bedroom. It was our dog Lulu, that got my attention, and showed me her new buddy was in the house! This is one of her new favorite hang outs. She crawls up into the doggy bed full of doggy toys and sets a while, then makes her way to the bottom shelf of the bookcase to take a longer nap. She has done this now, at the same time every day for the past 2 days. 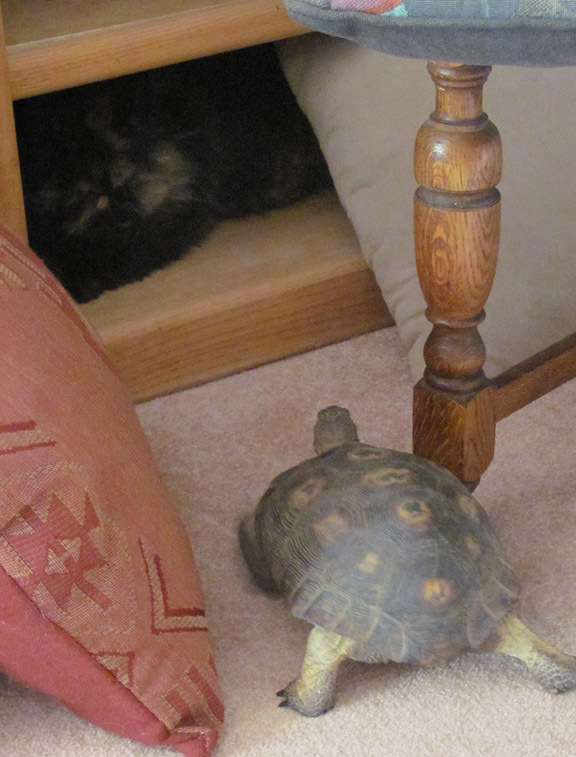 Today, she went a bit further..
She thought that she would share Zoe’s cubby hole. I had to grab ‘torti’ and put her outside, since I didn’t know exactly how her kitty sister would take the intrusion. 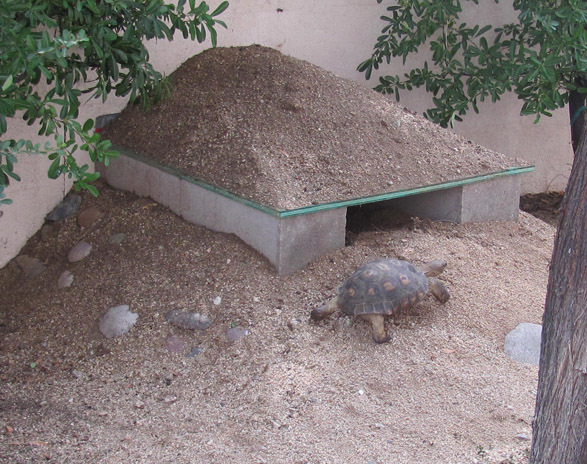 But, once I put her back out the doggy door, she goes back to her tortoise paradise. 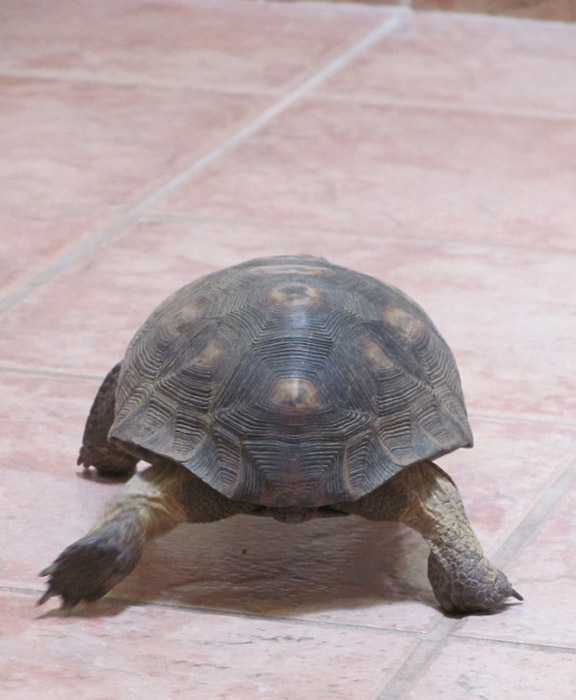 I can’t believe how this tortoise has a mind of her own…stubborn, courageous and sweet. Cooper, Baily and Zoe are in love, as are their parents! Wow, how do you guys attract soooo many cool visitors! What a sanctuary. Just beautiful Rondi and Todd! Sorry I haven’t commented before this…Have been very behind on blogging lately 🙂 The roof is treated plywood. My husband bought it at home depot.